An hour or so after my Incipient Spins and Steep Turns lesson, it was back into SFK with Ashley (the instructor who also authorised me for my First Solo) for a pre-Area Solo checkride. If this worked out and weather permitted, I hoped then to do my first Area Solo this afternoon. We got out to the training area via downwind departure from 11L, climbed to 3200 feet and first thing Ashley wanted was for me to demonstrate some stalls. I started to set up for a stall without thinking – and failed to do my HASELL checks. Serious and failable mistake in an exam situation. I definitely learned from this! HASELL checks are done for very good, real safety reasons. If an instructor asks you to demonstrate recovery from a stall, do the HASELL checks on your own initiative and don’t wait for the instructor to ask for them. If you fail to do the HASELL checks, you’ll probably fail your exam. A couple of stalls done and recovered (one flapless, one with 2 stages of flap), Ashley then asked me to talk through my responses in the event of a forced landing. Satisfied with my response, he then asked me to simulate one and demonstrate how I would respond. 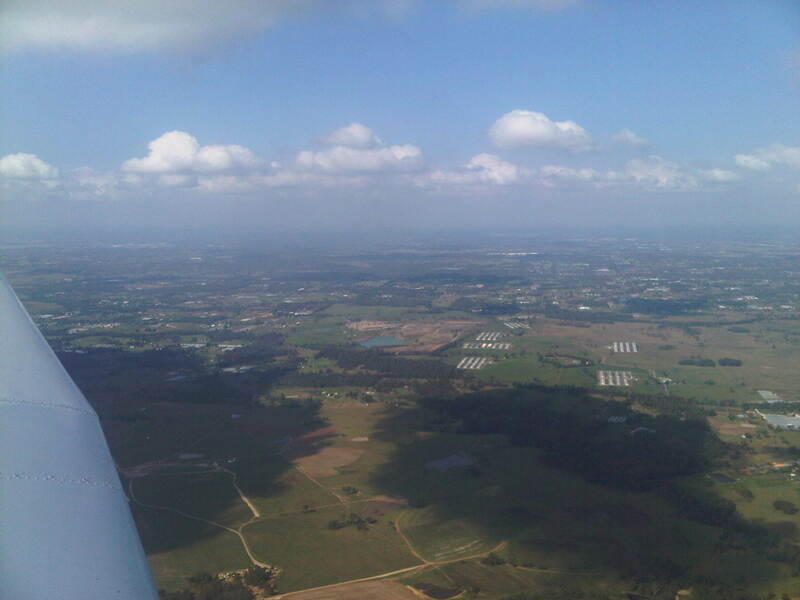 At 3200 feet I closed the throttle, adopted best glide speed and went through my Forced Landings routine. After a downwind, base and final turn I got us down to 700 feet above ground level and well set up for a forced landing in a field. 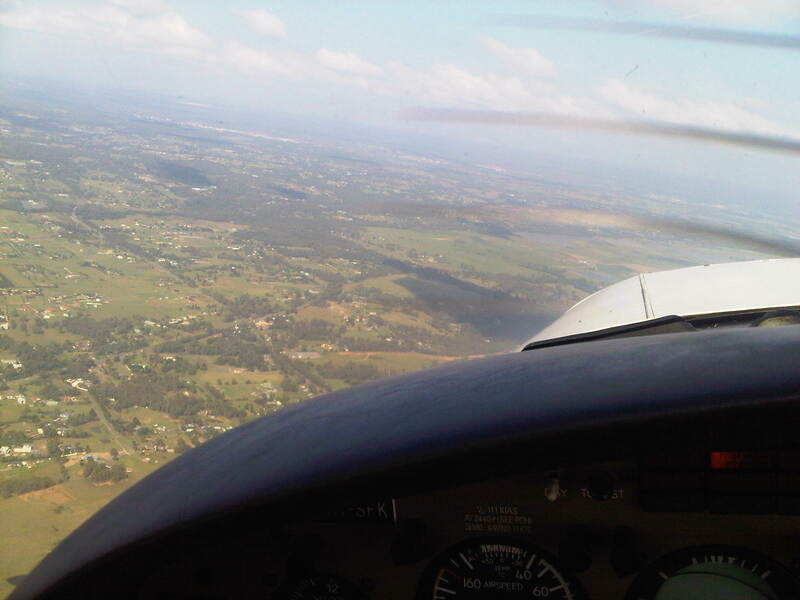 Satisfied that I would have landed, Ash then asked me to demonstrate some steep turns. These were done well enough, Ash providing me with some valuable additional tips on picking my nose attitude relative to the horizon and watching it to make it easier to maintain height in the turn. All done, Ash asked me to get us home. I headed initially for the reporting point at Prospect Reservoir, but after some prompting from Ash, I headed instead for the other reporting point, the 2RN radio tower. It’s a little harder to locate and see than Prospect, and I didn’t descend to the required report-in altitude of 1500 feet as quickly as I should have, but we got there. 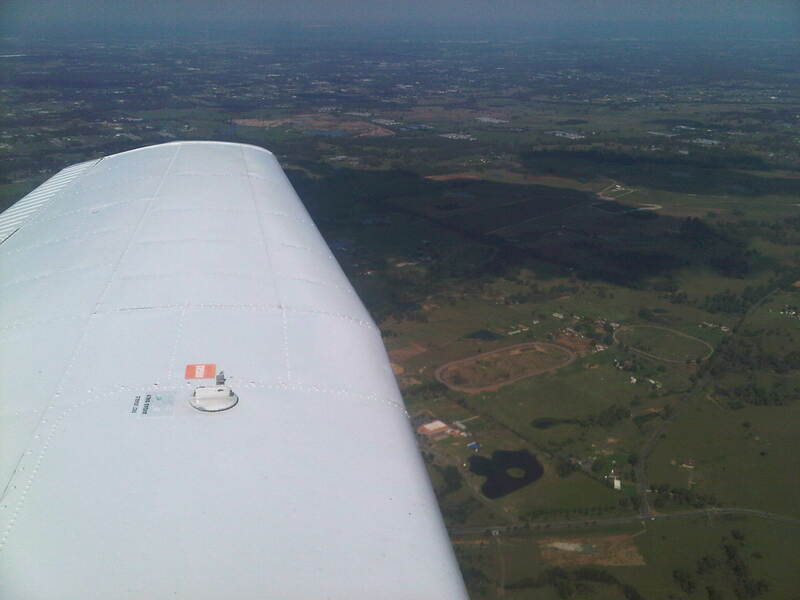 Reporting in from 2RN, we joined final for 11L by heading straight for Warwick Farm Racecourse, then we were down with a reasonable landing. Ash was satisfied with the checkride and cleared me for my first Training Area Solo flight! I took a half-hour break, then refuelled SFK up to tabs on each tank, and headed out by myself. Very excited, probably feeling a bit more capable and competent than when I did my first solo circuit. The ATIS report had changed, but departure was still from 11L. Run-up and pre-takeoff checks completed, I approached the Juliet 2 holding point and made my call. “Bankstown Tower, Warrior Sierra Foxtrot Kilo, ready for downwind departure on 11 left.” Receiving takeoff clearance immediately, I lined up and off we went. Climbing on downwind at about 900 feet I had a call from tower concerning a helicopter doing a circuit on 11L and that I should look out for it. I couldn’t locate the helicopter and never did, but at least I was aware of the traffic and was keeping a steady lookout. Levelling off at 1500 feet and heading for Prospect, I crossed the Liverpool-Fairfield railway tracks and climbed to 2000 feet. Bearing left and well clear of Prospect, once I passed the reservoir I changed transponder to 1200 and radio to monitor Sydney Radar on 124.55. Sighting Tadpole Lake ahead and 3 Lakes off to the left, once over the imaginary line joining these 2 landmarks, I then climbed to 2500 feet as I was now in the training area. I could have climbed higher – bottoms were at 3500 feet – but on advice from instructors I stayed low for this first solo. And I then kind of just tooled around the training area for half an hour. I kept Prospect Reservoir within sight at all times, so I didn’t go as far as Warragamba Dam or anything like that – might do that next time. I just did a few long turns, being careful not to cross over the Warragamba-Prospect pipeline. I took a few happy snaps with my Blackberry just to commemorate the event (see below). Then once I had been out long enough, turned for Prospect and headed for home. Descending to 1500 feet before I reached Prospect, I changed the transponder back to 3000, dialled up the tower on 132.8 and flicked on my landing light. “Bankstown Tower, Warrior Sierra Foxtrot Kilo, over Prospect one thousand five hundred, received information Juliet, inbound”. 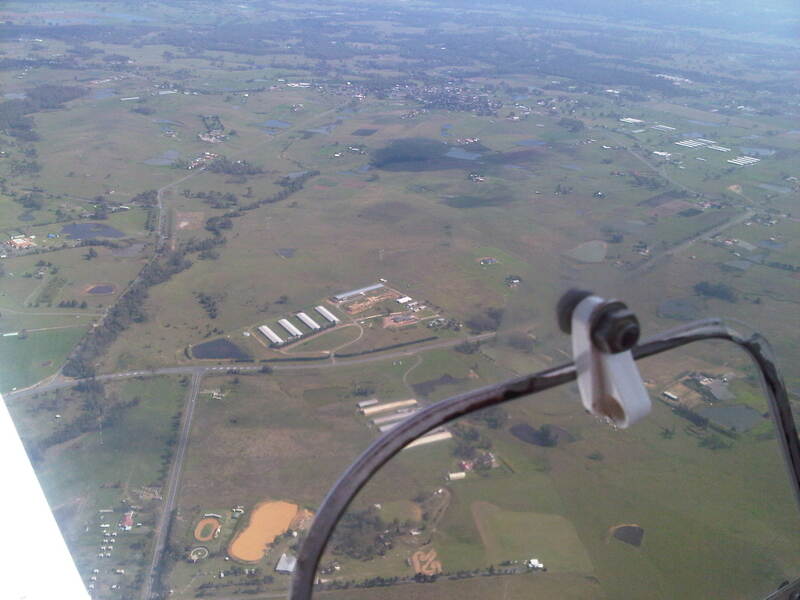 Receiving instructions to join final for 11 left, I turned right and headed for Warwick Farm Racecourse, descending to 1000 feet and completing my pre-landing BUMFISH checks. Lining up with 11 left, I turned and once over the railway tracks made my call, “Sierra Foxtrot Kilo, 3 miles”. Established on final, I received an early landing clearance and all that was left to do was to get down on the ground. With a bit of left crosswind, my landing wasn’t the best I’ve done, but I and SFK got down in one piece, then I was parking on the flight line and shutting down. 0.9 hours in command, and the first time I’d been let loose away from the airport by myself! I was well pleased. 2 more training area solos to follow early next week. Today was an extremely ordinary day from a weather point of view. 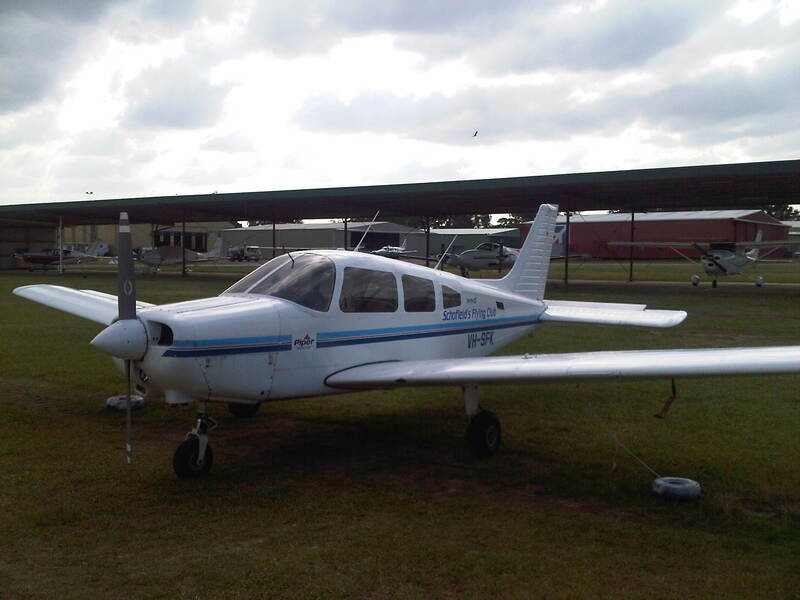 However, we did get up this morning to do my 2nd lesson of Basic Instrument Flying (building on my rather successful first instrument flying lesson several days ago) and to do a simulated radio failure on return to the aerodrome. We headed out into the murk (bottoms broken around 2000 feet) in UFY. After turning left off runway 11L, John almost immediately directed me to put on the hood. A few minutes of flying on instruments and then John made with the post-it notes, progressively blocking out more of my flight instruments (altimeter, vertical speed indicator, airspeed indicator, turn coordinator) to simulate instrument failures. Very difficult to fly on instruments without benefit of my altimeter – when John removed the post-it note I found that I’d lost a few hundred feet in altitude despite my best efforts to fly straight and level. But all this must have gone OK, because we then progressed to the next part of the lesson. John directed me to put my head down (so I couldn’t see any of my flight instruments) while he put the aircraft into an “unusual” attitude (eg. nose high or nose low, wings banked, airspeed rapidly increasing or decreasing) and then had me resume control and quickly restore the aircraft to straight and level flight using only instruments. Not easy. But again, must have done OK. In a nose-high attitude with airspeed decreasing, basic drill was to increase power, lower the nose and level the wings. Conversely, in a nose-low attitude with airspeed increasing, basic drill was to reduce power, level the wings and level out. I’m under no illusions that I’m anything like a capable pilot on instruments. There is, after all, a reason that there are entire ratings devoted to learning this highly specialised flight skill. As I’ve mentioned before, I’m not allowed to go anywhere near cloud and never intend to, but it’s good to have had at least an elementary exposure to instrument flying. Scenario: I’m out in the training area, returning to the airport and I tune my radio to the ATIS to find out latest weather, runway direction etc. No joy. I try to get the tower frequency, no luck there either. I try to figure out if there’s something easily fixable with my radio set – volume, squelch, correct frequencies, switches etc. Still no luck. What do I do then? I have to get back to the airport and get down somehow. If red light sighted or no light sighted, go around and repeat until tower “wakes up” and signals me in! Not a circumstance I want to encounter in real life, but at least I know what to do now. The weather turned filthy, so I sat my Pre-Area Solo exam and got that out of the way (86%). If the weather is good tomorrow, I may fly 3 times. Need a lesson on Steep Turns. Then I have a checkride booked with Ashley (from my first solo) to verify my readiness for my first Area Solo. And if that works out, and weather still permits, I’ll do my first Area Solo tomorrow afternoon. Weather I do Area Solo tomorrow or early next week, I don’t mind so much, but really looking forward to it. First solo sortie away from the airport! First time around I’ll basically fly out into the training area and kind of float around for an hour, keeping good proximity to Prospect Reservoir so I can find my way back to the airport. One done, my 2nd and 3rd area solos will be similar but I’ll be able to do some more practice of stalls, forced landings etc. And, we’re planning ahead now to the GFPT (General Flying Proficiency Text) exam. We’ve booked our Chief Flying Instructor for Wednesday 13 April! There’s plenty of flying to do before then, and also the BAK (Basic Aeronautical Knowledge) theory exam. But now it’s getting serious. The GFPT exam is a good 1.5 hours in the air and probably another 30 minutes or so on the ground. Exciting, a little daunting, but this is what I’ve been after. Once this is done, I’ll have my “restricted” licence and will be able to carry passengers in the local training area. Following that point, it’ll be the cross-country navigation exercises and accompanying theory leading up to the full PPL (Private Pilots Licence). Some or most of this component I’ll be doing part-time, as my 5th week of my 8 weeks off work is almost done. But that’s all fine.